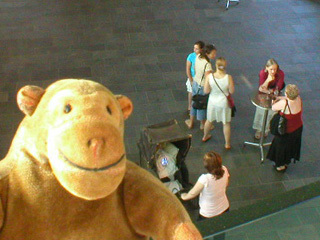 "I can't help thinking it's a strange baby"
Mr Monkey scurried upstairs to go to see the exhibition. 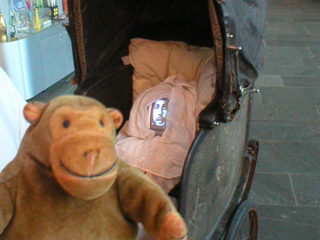 Looking down he was intrigued to see that the baby in the old pram that was being pushed around had a strange TV-like face, and decided he needed to investigate later. All the people who seemed to be responsible for the pram abandoned it to turn into a band called aqute couch. 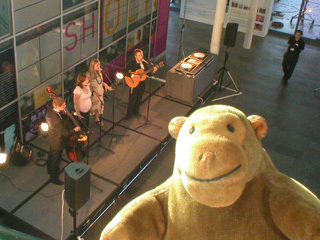 Mr Monkey was a little too high up to hear properly, but he liked what he could hear. 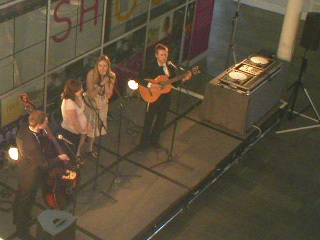 You can read about the band, and explore their labyrinth, at the aqute couch website. It's all in Flash, though.